Stampede for Scarce Food, or Oust Obama and Restore Glass-Steagall. BREAKING => Senate Bill S 510 Food Safety Modernization Act vote imminent: Cannot Eat Nor Grow Food In The British Monarchy’s Earthly Garden! U.S.-Canada agreement beyond just borders, ‘streamlines and harmonizes’ food and auto regulations under THE FICTITIOUS North American Union corporate agenda. The secret deal merges many aspects of each nation’s law enforcement and terrorism efforts, allowing authorities to operate on the opposite side of the border while beefing up border check surveillance. But there’s much more that we don’t yet know. 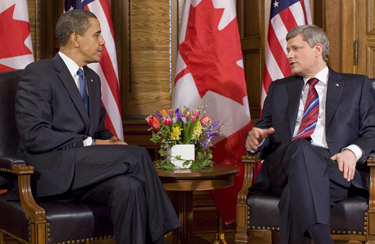 U.S. President Barack Obamaand Canadian Prime Minister Stephen Harper are set to meet next week in order to sign a thus-far secretive “Beyond Borders” pact between the United States and Canada– and surprisingly, the deal will mean not only new practices in border security, law enforcement and counter-terrorism but also in standards for food production, trade and commerce. The 32-point border perimeter plan is clearly part of the North American Union agenda, but many observers also believe it will open the doors to many GM crops now banned in Canada and enhance the positions of dominant corporate players. However, the details of the agreement remain secret and will only be revealed once both heads of state sign the deal– negating the necessary process of public feedback and consent. While the Canadian press has rightfully focused on the massive power grab and privacy concerns posed by the new system (Privacy Commissioner Jennifer Stoddart expressed concern, stating that “she hasn’t been consulted on the project”), the deal will also have enormous impact on trade and industry, especially food. The 32-point plan also features more than just new border-crossing protocols… In fact, both nations plan to streamline and harmonize regulations in the automotive and food sectors. While the immediate impact for the auto sector could mean, among other items, the adoption of “U.S. crash-testing standards for seat belts and built-in child booster seats,” there are scant details on what it would mean for food. However, many critics of the deal are concerned that it would eliminate barriers for aggressive biotech firms like Monsanto, who’ve thus far received a less than warm welcome in the great northern nation. While GMO corn has gained acceptance in Canada already, farmers and activists have successfully fought or delayed the approval and entry of numerous other GMOs, including Monsanto’s recombinant bovine growth hormone (rBGH), GM alfalfa and have effected a court-ordered investigation of the effects of pesticides on amphibians, including Monsanto’s Round-up. 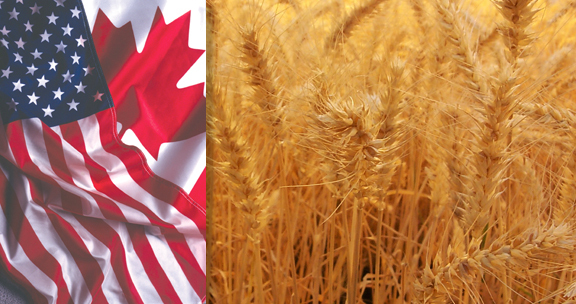 But the most notable victory against GMOs may be wheat, a major export in Canada worth more than $3 billion per year. It is the Canadian Wheat Board that got credit for fighting Monsanto against the potential effects of wheat contamination for the vast industry, and effectively prevented its entry into Canada. Mitt Romney Is CFR’s Door To De-Population: Fascists Obama USA & Harper Canada ~ Deregulates International Borders For Streamlining Monsanto GMO Foods That Are Linked To Organ Failure. “It has the potential to virtually destroy the $3.5-billion industry in Western Canada,” said Ian McCreary, a farmer and a director with the Canadian Wheat Board back in 2003. By coincidence, the powerful Canadian Wheat Board was dismantled earlier this week, with many farmers now concerned about changes in market dynamics, and the potential for Big Agra corporations to move in. The Wheat Board decision is just the beginning. They are coming after the dairy and egg boards. They won’t be satisfied until Viterra and Cargill and Monsanto control every bit of farmland in this country. Indeed, Canadian papers are full of discussion on the topic, with pro-globalism articles blasting the country’s food tariffs and praising the new “freedom” for farmers no longer bound to the wheat board system, always with an eye on dairy and poultry. Critics say consumers pay a heavy price for the protectionist policy, and they argue Canada won’t be able to strike an aggressive free-trade deal with Asia-Pacific countries because of strong objections from Canada’s trade partners who oppose the supply management system. They also have argued it is inconsistent for Ottawa to liberalize western wheat markets while maintaining the protectionist system for the dairy, poultry and egg producers. This study addresses a new issue in the commercialization of GM crops, namely the occurrence of traces—or “low-level presence” (LLP)—of nationally unapproved GM material in crop imports. The commercialization of GM crops is a regulated activity, and countries have different authorization procedures. Hence, new GM crops are not approved simultaneously. This “asynchronous approval” (AA), in combination with a “zero-tolerance” policy towards LLP, is of growing concern for its potential economic impact on international trade. Once again the banner of globalism and “free trade” will put pressure for acceptance of GM crops. The LLP angle is a great half-measure and camel’s nose under the tent. Obama Heads Into The New Year Knowing He’ll Have To Validate A Long Vault Birth Certificate In All 50 States. BREAKING => Obama Must Produce Long Form Vault Birth Certificate In Open Court January 26, 2012. Farmers are rightfully outraged at the trend. This op-ed printed at BClocalnews.com cites the threat it poses to the growth of organic farming in Canada, cited here at an astounding overall industrial growth rate of 20 percent per year. I am writing to state my strong opposition to federal government plans to allow so-called “Low Level Presence” of unapproved genetically engineered (GE or genetically modified, GM) foods in the Canadian food supply. This plan would not only undermine the work of Health Canada, but would undermine the entire organic agriculture industry in Canada, which is a major part of the overall industry and which is growing at about 20 per cent per year… It is unacceptable that our government would allow a percentage of GM foods into Canada that have not been approved by Health Canada. To forecast the future evolution of this issue, we compiled a global pipeline of GM crops that may be commercialized by 2015… While currently there are about 30 commercial GM crops with different transgenic events worldwide, it is expected that by 2015 there will be more than 120. Clearly, the amount of successful resistance to GMOs among Canadians has posed a problem for biotech. So-called “free trade” agreements that actually form cooperative blocs, including the U.S. Canada effort and the concurrent Trans-Pacific Partnership, aid in breaking down the barriers of local resistance to trans-national agricultural planning. Biotech corporations are all to likely to seize upon this change, with sights on untapped Canadian markets. Update On 20113 West/Waco Texas Fertilizer Plant Missile/Laser Strike: Government Motives To Destroy It With A Missile! ← Our Loving Obama Fights In Court Again For McCain’s Unconstitutional NDAA Rule Of Detention & Incarceration Of U.S. Citizens Without Trial.